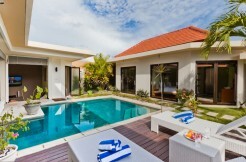 This 3 bedroom Villa in Seminyak features two air conditioned king bedrooms and a large twin bedroom. A beautiful private swimming pool completes the picture. Contact us for more details. This 3 bedroom villa in the popular Canggu area on Bali’s west coast ticks all the Bali holiday boxes.